Feminist collectives, LGTBI, Podemos, IU and the SAT are promoting mobilizations in Andalusia before the investiture of a rightwing coalition including the new fascist party Vox, on Tuesday 15th and 16 Jan..
Its the first time since the Dictatorship that openly fascist candidates have been elected and the far right have gained control of the Andalusian local parliament. The PP got the support of Vox without openly assuming its shocking anti feminist measures but Vox with 10 seats will hold the balance of power.. The news of the despicable Vox in power generated rage on social networks and sparked calls for multiple demonstrations and rallies on the investiture dates, on January 15 and 16 . 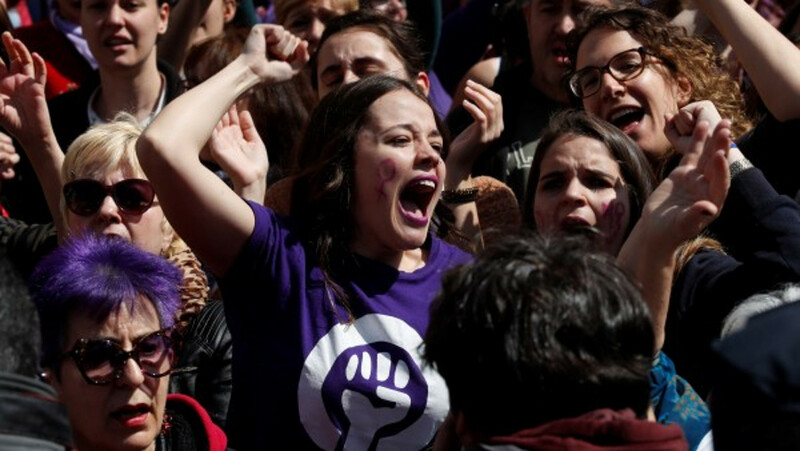 Podemos and Izquierda Unida parties yesterday joined the feminist calls to demonstrate and encouraged their respective militants and supporters to attend the events planned next Tuesday: a concentration at 12.00 in the Andalusian Parliament (Seville) and provincial concentrations at 7:00 p.m. in different points of the Andalusian cities. 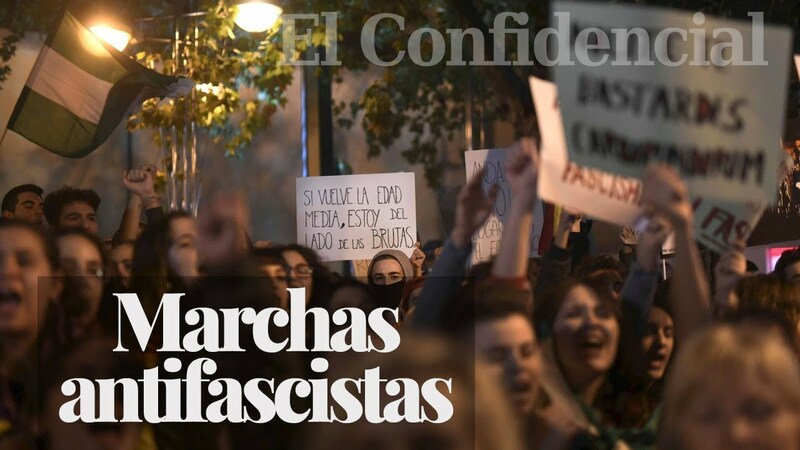 The mobilization is driven by a large group of feminist organizations that on Wednesday presented a manifesto for what they consider an “attack” by the party led by Santiago Abascal, with its claim to repeal the Law of Gender Violence. 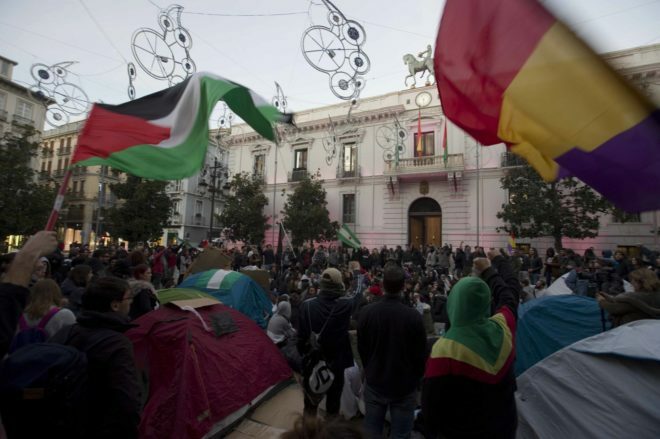 Support demonstrations and actions have also been called in towns and cities across Iberia. Under the slogans ‘Not a step back in equality’ or ‘Our rights are not negotiated’, posters in purple and blue tones have been distributed quickly through social networks to gather as many people as possible on January 15. Leaders like Antonio Maíllo, from IU (communist), or Teresa Rodríguez, from Podemos( Left) and candidate from the confluence of both formations, Adelante Andalucía, yesterday supported these initiatives and urged citizens to support feminist mobilizations. The LGTBI movement also joins the feminist demonstrations in rejection of the reaction and regression in the conquered rights that they believe the pact between PP and Cs with Vox will bring. But in addition the Andalusian Union of Workers (SAT) called yesterday a protest called ‘Surround the Parliament’ for the day of the celebration of the full investiture in which the candidate will foreseeably be voted on next January 16 . In principle, the union has requested authorization for the possible days – the date is still unknown – and aims to surround the Parliament with a human chain, the SAT said in a statement. This protest will take place from 18:00 hours on the day of the investiture under the slogan ‘Andalusia is not for sale’, with the intention of preventing the change of government with its aim to launch “new attacks” against social rights and democratic institutions and public services, with privatizations and cuts in social policies. The union indicated that the new government will also mean “a threat to women’s rights and policies of equality and a promotion of sexist violence” and invited other anti-fascist and feminist groups to protest, since theirs will be a “complementary” mobilization » to all the other demos on that day. Both García and Navascués agree that one of the keys to the rise of the far right is as “very clear reaction to the 8M Womens General Strike.”. A famous quote by Simone de Beauvoir has gone viral in recent days. A phrase from the forerunner of feminism that says: “Do not ever forget that a political, economic or religious crisis will suffice for the rights of women to be questioned again. These rights are never taken for granted. You must remain vigilant throughout your life. ” In this line Dolores García deepens by stating that “any gap that is opened globally, in the political or economic space, will cause a reinforcement of patriarchy” to explain the current situation. “Patriarchy becomes very angry when feminism takes center stage, not only here, but in Latin America, all over the world,” something that connects García with the economic system because “the neoliberal model needs women to do care of life work, to corner ourselves around the family, bringing up kids”. Police violence at an anti fascist counter demo against a meeting of the new VOX party in Girona, Catalonia. 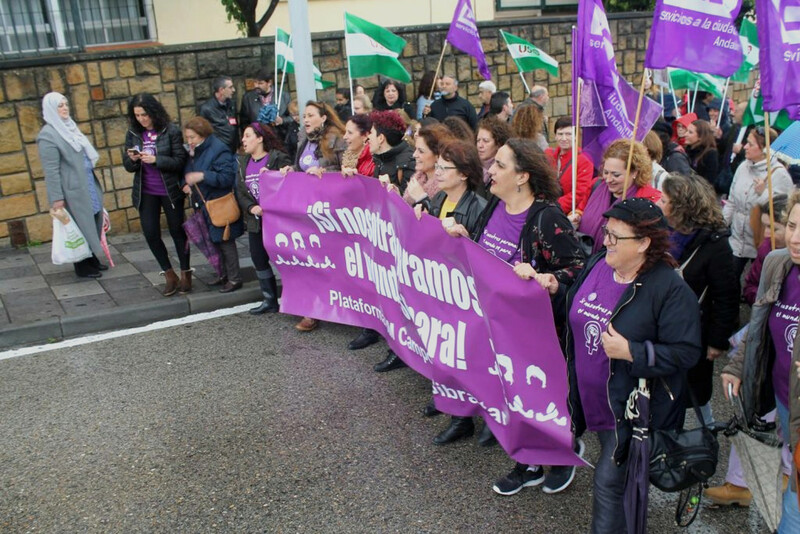 The new Family Counseling or the anti-abortion plan in the PP-Vox agreement are other measures denounced by the Andalusian feminist movement. 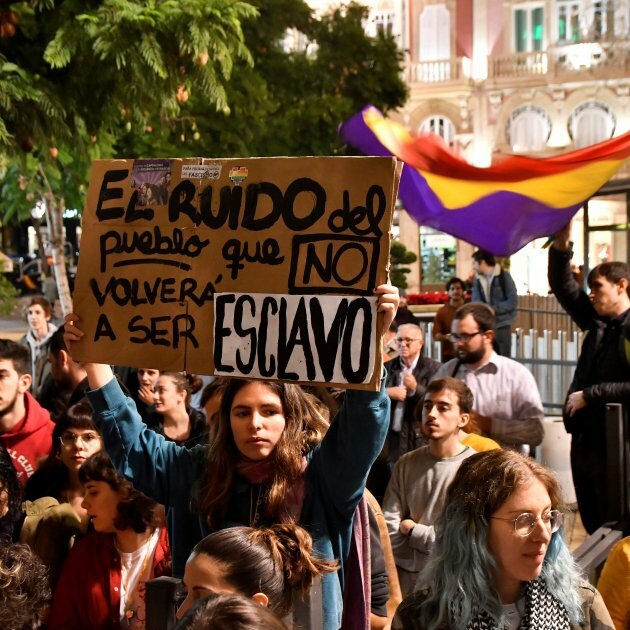 With the same sense of “aggression” to their rights, the Andalusian LGTBI community has joined the mobilizations in the provinces and in the capital. Rafael Gil, president of the association Delta LGBTIQ of the Sierra de Cádiz, calls LGTBI people to second the mobilization. In addition, the historic Grenadian transsexual activist Kim Pérez has announced a hunger strike in protest. “We will not stop being visible in front of this danger to our rights, which we thought was already extinguished, in my case, through a hunger strike, which will represent the anguish that will be renewed now, as long as the new leaders do not declare the will to respect us”. Beyond the 15th, the Andalusian feminist movement is thinking of ways to counteract the messages of the extreme right. In the opinion of Dolores García, one of the keys is “to work much more in the neighborhoods, because sometimes we do not reach those towns where women or the poor are most vulnerable. We have to get to those spaces to counteract the discourses of fear that lock up women in the house. ” On the other hand, Alicia Navascués thinks that it is not enough to protect the conquered laws but to denounce “very dangerous speeches of the Citizens Party that seek the commodification of the woman’s body, such as the legalization of ‘rent bellies’ or of prostitution”. However, both are optimistic. “In the face of such an attack, there is going to be a strengthening, uniting different feelings of feminism,” says Garcia. “From now on we’re going to have a unified, strong feminist movement. We’re going to confront them, and the legislative change for the worse is not going to happen..”.